In case you're wondering, I'll walk you through what's included here. 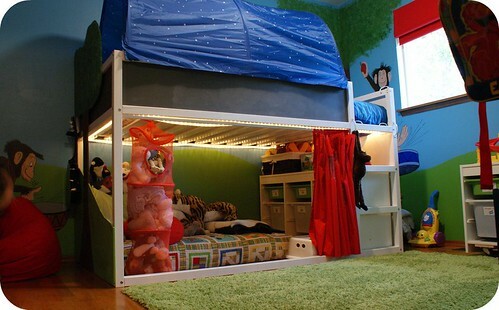 The bed is the Ikea Kura bed with optional tent attachment up top. I had painted all the blue panels of the original bed with chalkboard paint and the natural wood frame with semi-gloss white paint when we first bought the bed. The bed now sits on a plywood platform (2 cut pieces actually since one wasn't quite big enough) that rests on three Ikea Trofast frames. The plywood is also supported in the back and under the slide by 2x6 wood screwed into the wall studs. I also added the vertical support and horizontal bed guards for the lower bunk to keep kiddos from rolling out in the event the Snickerdoodle has a sleep over. We built the slide ourselves using 2 sanded 2x4s, an 18 inch wide scrap of plywood left over from the bed platform and an 18 inch wide piece of what I believe is intended to be dry erase board (Update, I found it on Home Depot's website here). We bought it at the Home Depot in an 8 feet by 4 feet piece for $13.97. The slide is 7.5 feet long and starts pretty high up so it is steep but apparently quite fun. At the top of the slide is a platform for him to climb onto before sliding down the slide. Underneath it all is wide open space for a secret hideout (shhhh, don't tell him I told you). It is accessible by crawling under the slide which Mr BSR and I can both do (we just barely fit). So, there you have it. I'll leave you with a few more pictures. Toy storage and a safe place for the globe and his stereo. Please don't hesitate to contact me directly or through a comment if you have any questions about how to build something like this for yourself. I can provide all sorts of dimensions and materials lists and such. UPDATE: The specs for how to build a slide are here and how to build out the build out the whole bed unit can be found here. I have been looking for a LONG time to find out how to change my little guys Kura bed to somethings I like- and I LOVE this!! With the slide- what did you use/do to keep it angled like that so it doesn't come crashing down? I am definitely going to do this- such an inspiration!! Stephanie - I'm so glad this gave you inspiration. That's always my hope when I post something I did without including a tutorial. At the top of the slide, there's a platform that he climbs on to from his bed. It is level with the bottom of the mattress, not the top of the bed so he climbs from the mattress side, over the top edge to the platform. 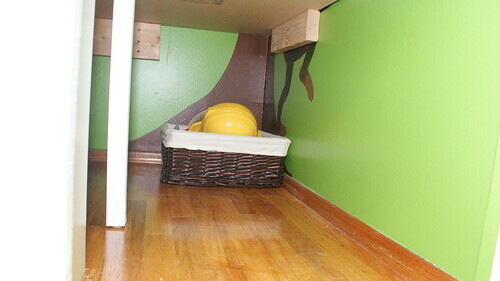 That platform is screwed into the studs in the corner back there as well as to the bed so it is super secure. The slide is then screwed to it as well as to several vertical supports. If you look carefully at the second picture on this page (the first one that includes the slide), you can see one vertical support about halfway down the slide pretty easily. There's another one under the slide on the opposite side. That one is actually screwed into a 2x4 (painted green) that's screwed into a stud under the window. Because of the window sill, we couldn't attach the slide directly to the wall but if we had been able to, some bolts through the slide rails and into the studs would have been more than adequate for that side of the slide. It was tough getting the angles right on the vertical supports but the tops of them are all cut so that they sit flush against the 2x4s that make up the sides of the slide. We couldn't seem to figure out exactly where each would sit so we actually cut them to an approximate length then slide them into place while holding the slide up. Once they were in place, we screwed through them into the slide and attached all vertical supports to the bed build. I hope this helps, if it still isn't clear, shoot me an email at julie at buildsewreap dot com and I can take pictures for you. My husband actually slid down the slide and it didn't move at all so it is indeed very secure in there. 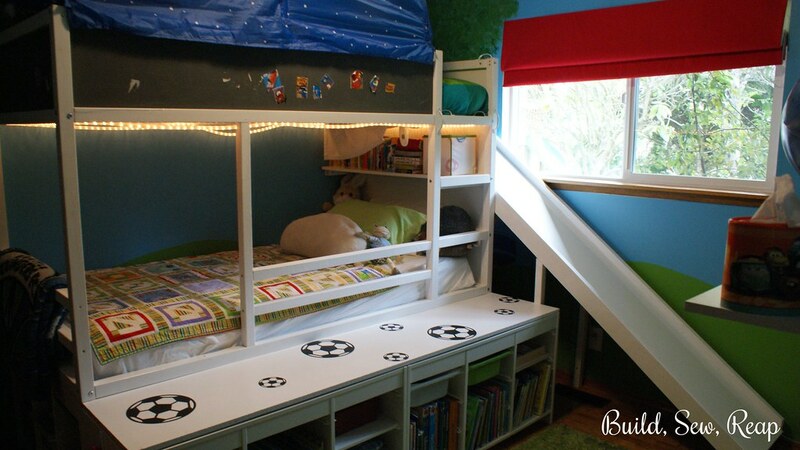 I'm so happy I found a KURA bed with a slide this is exactly what we want to do with our daughter's bed. We were thinking about a slide with a 90 degree turn. Starting from the end (like you did) so it doesn't stick out into the room. Do you have any thoughts about that as opposed to a straight slide? Anita - If you don't raise the Kura up on the storage units, you could do a reasonable length slide that probably wouldn't stick out too much. If you really want a right angle, you'll either have to make a landing where she'd stop (with a tall enough edge that she doesn't just slide right on past) and make the turn on her own or you'll have to angle the corner so she banks around on her tush. You might want to look around on Craigslist or your local Freecycle to see if anyone has a plastic slide with higher edges that's already turned if you don't want to do the landing. Personally I think I'd just do the landing idea. If you do the build, with a turn or not, I'd love to see pictures. Please share! 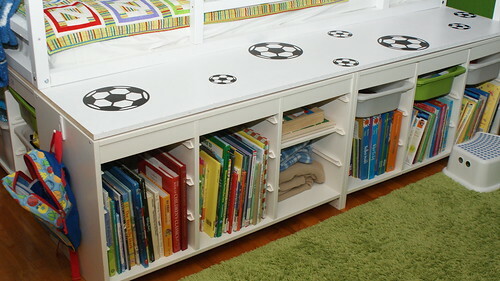 Love the added bookshelf storage on the front! What a neat idea, great work! What an AMAZING bed for your special little guy! What little boy wouldn't love this! I found you through the Frugal Girls' Chic and Crafty Party. I'm looking forward to seeing more of your creative projects! This is awesome! In case others are looking for it - the slide board is often called shower board (I bought one and had them cut it up to use for dry erase boards). Now there are 2 options for making a slide. Either way, be sure to support the back with some plywood or something strong. Sharla - Thanks for stopping by and leaving a note! I'll work on the details. I think I'll create another post but it'll have to wait a week or so . . . we're gearing up for his actual birthday party coming up and I'm drowning in soccer-themed projects. :) Thankfully I saved my notes though so it shouldn't be too tough to get it all in a post. Thank you for stopping by! Thanks Heather. I love that when we look into his room, we see what we value - reading and books!! We don't have a playroom at all so his toys are in there but he doesn't have a lot since we push for more creative play with fewer toys. I never mind having a huge collection of books though. He can get to those from inside his fort too since there aren't backs on those units. Thank you for stopping by and leaving a comment. this is awesome .. will wait for a tutorial .. thanks! You bet. I'm still working on it. I need to remember to take more pictures but unfortunately I do all my blogging when he's asleep so I keep forgetting to do it until he's already in bed. I'm also trying to create some clear diagrams. I'll shoot you an email when it's up though. Thanks for reading! Me, too!!! jessicajonnie@gmail.com Very cool!! Seriously? 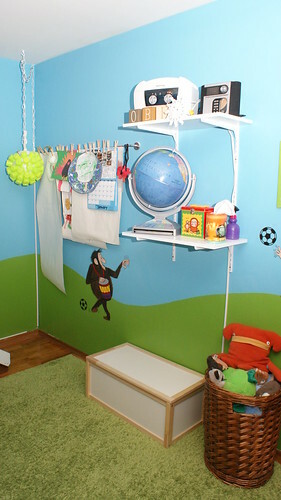 Your making my boys room look so boring! Ha! I'm wondering how I could add a slide to MY room now! I love what you've done here and I'm thinking about doing something rather similar - one question though. Is the Trofast system with the plywood supports strong enough to hold adult weight? My son (4 years old) still likes for me to lay with him some nights and I want to know if this set up will support my weight and/or the weight of my husband and son (close to 210 pounds total). Thanks in advance! Hi Cris - it is holding up just fine for us. I think we have all loaded into the bottom bunk for story time even. Just make sure It is well supported on the 2x6s bolted to the studs in the wall too. 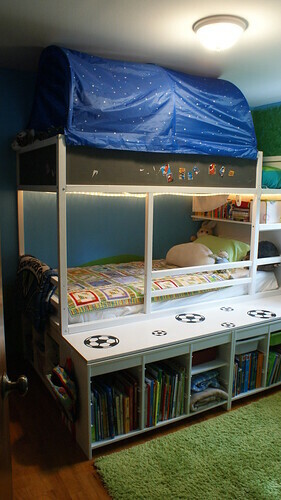 Loving it, one of my cousin bought a bed like this for his son, it sure looks nice but wasn't affordable so i skipped buying it, such kind of beds provide great living experience to children. Some purchases and comparisons are not to be taken lightly and need to be done in person. Certain purchases require the time to go to different stores to compare and contrast more than just the price. However, research and reviews found online could make the difference between a good purchase and a great purchase. Hi, Julie! We love your hack and are going to attempt it ourselves. Do you think it would still work if the plywood sheets were smaller in width and the bed/plywood sat on top the Trofast unit so that it is flush with the bed and doesn't stick out? 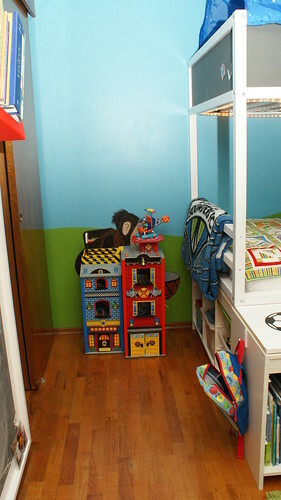 It would minimize the playspace underneath, but would take up less square footage in the bedroom. Trying to figure out how to make this work. Thank you!! Harlow King Sheet Set: This set is made of beautifully designed flat sheets, fitted sheets and two pillow covers. silk bed sheets king Bed sheets come in a number of fabrics.